This is the final edition of Eco Investor Update in its current format. From now on it will be refolded back into Eco Investor magazine, and the magazine will revert to be being published monthly instead of every second month. Thus the news will again be available through the magazine, as was the case before the first Eco Investor Update in September 2010. The changes do not affect subscriptions. Among other reasons, the change will enable our resources to be better focused on higher value analysis and comment than straight news which is widely available. There will be more discussion on the changes in the upcoming issue of Eco Investor magazine. Meanwhile I thank all of you for supporting Eco Investor Update over the past two and a half years and 123 editions. DUET Group has continued its two year rising trend with its security price reaching a new two year high of $2.32 on 28 March. A six month rising streak saw ERM Powers share price hit a new all time high of $2.73 on 28 March. Australian Ethical has invited applications for Community Grants program that will make available over $100,000 to not for profit organizations and community projects. Applications are open for three months from 1 April 2013. Australian Ethical said that the last few years have seen almost 1,000 applications and this year it hopes to set a new record. Weve been working with the not for profit sector for over a decade and we know that for many organizations obtaining funds is more challenging than it has ever been, said Paul Smith, General Manager  Strategy and Communications. Australian Ethical donates 10 per cent of its annual profit every year through the grants program, one of the highest percentages in corporate giving in Australia. Since the inception 12 years ago, the program has provided over $1.3 million. 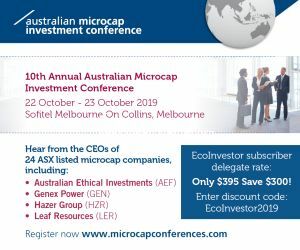 Australian Ethical manages the Australian Ethical Smaller Companies Trust, Australian Ethical Advocacy Fund and Australian Ethical International Equities Trust, among other funds. The general pick up in the stock market since June 2012 together with significant improvements in the value of the green investments has seen a turnaround in the value of August Investments portfolio, said managing director, Damien Lynch. Unfortunately, there are not a large number of such green investments with a positive financial position to be found. We have therefore looked at two sectors which are expected to provide positive benefits in the medium term. These are I.T. and Telecommunications share investments. Within these sectors we have been able to identify individual investments which have already provided us with exceptional value through increasing profits, increasing dividends and growth in share values. The Telco sector has an ever growing market based on consumer demand and the implementation of the National Broadband Network. Such investments include TPG Telecom, My Net Fone, M2 Telecommunications and Amcom Telecommunications. August Investments share price has increased 11.6 per cent in the nine months from June 2012. To take advantage of the trend, August is looking at a rights issue in the near future. AFT Corporation sold as many solar panels in 2012 as it did in 2011, but its revenue was down due to substantial falls in world panel prices, says director John Zhang in the companys annual report to 31 December 2012. Ceramic Fuel Cells and Energy Services Company (ESCo) iPower Energy (iPower) have received the go ahead for their first housing association project - with Housing Solutions, a housing association in Maidenhead, England. This follows the January distribution agreement between the two companies. Initially 10 BlueGen units will be deployed with each unit serving on average five flats. The tenants will enjoy cheaper, lower carbon electricity and a minimum discount of 10 per cent against the best locally available standard electricity tariff. iPower expects to replicate the project with housing associations around the country. Green Invest has provided what it calls preliminary projections for its Green Plumbers Green City program in the United States. The company said there is accelerating uptake by municipalities and utilities and the model for the program has now been sufficiently quantified for preliminary projections. The program gives a route to market for manufacturers and the suite of products will be increased by association with non competing manufacturers. Year 1 projections are for Membership and Client Service fees of US$499,900, Green City Project Revenues of $2.569 million, and Other Revenues of US$242,500 for Total Revenues of $3.311 million. Phoslock Water Solutions has completed the application of 125 tons of phoslock to three UK lakes, with the projects having a total value of $500,000. Shares in Dart Energy fell to a new all time low of 10 cents on 27 March. There were no ASX announcements; however the next day the company made the national news when residents of Fullerton Cove, north of Newcastle, protested the dismissal of their court bid for a more rigorous environmental assessment of coal seam gas exploration in the area. The residents had told the Land and Environment Court the exploration will affect part of Newcastle's drinking water. But the Court lifted an injunction preventing Dart Energy from sinking exploratory wells around Fullerton Cove. The ABC reported a resident saying there are 85 homes within a two kilometre radius of the Fullerton Cove wells, with the nearest home only 400 metres away. Actinogen said it has discovered actinomycetes that produce plant growth hormones. Tests in pot trials recorded significant extra root and leaf growth in broad bean plants, and independent trials have been set up to further test their performance. Shares in AnaeCo fell to a new all time low of 1.1 cents on 28 March. Enerjis second customer, an ASX top 200 company with a gold mine in the Asia Pacific, has placed an order for installation preparation of a waste heat to power system (WHPS). For an agreed initial fee, Enerji is undertaking the first stages of design and planning and preparing a construction contract. The WHPS should save over a million litres of diesel and thousands of tonnes of CO2 each year. Enerji said the company considers many other off grid mining sites would benefit from similar opex reductions. Site visits, a viability assessment and commercial negotiations have taken several months. Enerji said its pipeline of new project targets includes three possible further projects with this same customer as well as other mining companies with remote operations. Enerji has also submitted a detailed bid for another mine site in WA that has been well received and is awaiting reassessment of the mine life before proceeding. Some further preliminary site assessment work has also been conducted for an Australian industrial site with significant potential for an Enerji WHPS. This is a more sophisticated application involving potentially five units. Geodynamics shares plunged over 20 per cent leading up to and on the announcement by Origin Energy that it will withdraw from the Innamincka Deeps Joint Venture effective 30 June. In August last year Origin ceased funding its joint venture share of the costs to complete the Habanero 4 well and had earlier decided not to participate in the proposed 2012-13 Work Program and Budget to complete the testing program and trial operations of the 1 MW Habanero Pilot Plant at Innamincka. Geodynamics managing director and chief executive officer Geoff Ward said Origins support since joining the joint venture in 2007 allowed Geodynamics to significantly progress the development and demonstration of an Enhanced Geothermal System in Australia. With the successful completion of the Habanero 4 well in September 2012 we have demonstrated one of, if not the, highest productivity EGS tests performed in the world achieving a significant improvement on earlier well results. We look forward to the successful trial operation of the 1 MW Habanero Pilot Plant, commencing in April, continuing these positive results.